A blowdown separator is the best choice when space limitations preclude using a large tank to collect and hold the effluent while it cools to an acceptable drain temperature. 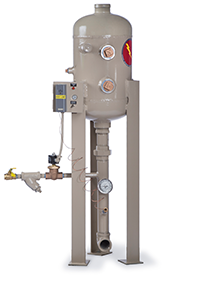 The blowdown separator accepts boiler blowdown, vents the portion that flashes to steam, but does not store the effluent until it cools. Instead, a temperature controlled mixing valve mounted in the tank’s discharge piping adds cold make-up water to cool the effluent as it immediately discharges to the drain.